An updated version of Paquete de regalo de Joyatrón 4000 with 1000 more awesomeness! Blingtron is coming back, more powerful than ever and he will battle other Blingtrons because there can only be one king of swag. I think it might be slightly appropriate for it to have an ever so slim chance (0.5%) to drop Mim's head OR even better: a look-alike mount/pet, blizz loves reusing models. Does it share the same daily reward cooldown as the blingtron 4000 for the packages? 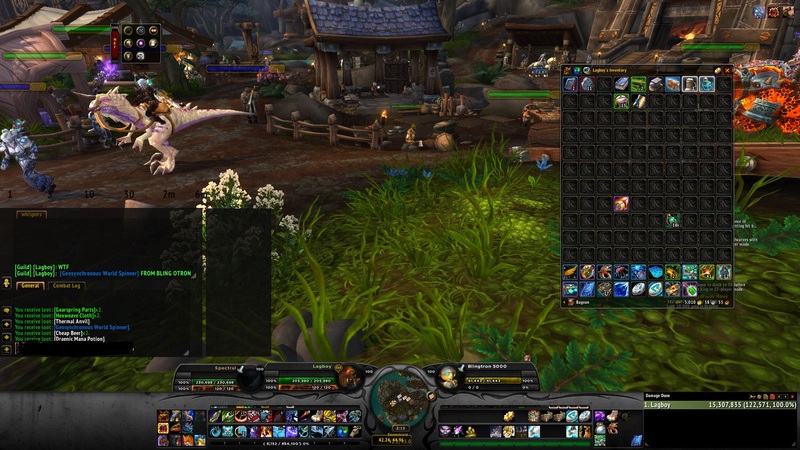 If so why would you pick the 5000 package when the 4000 can drop pets and mounts? For those who are wondering, no this does not share a cooldown with Blingatron 4000 in any way. UPDATE: You will be able to get aswell! Got it in my first gift! Not a huge fan of these as I normally get crafting mats that are soulbound that I can't use. Is the package account wide? I can confirm that the Bombita drops from this even though it isn't in the loot-tables! Screenshot here. Paquete de regalo de Joyatrón 5000 can contain Partes de amortiguador which bind when picked up. 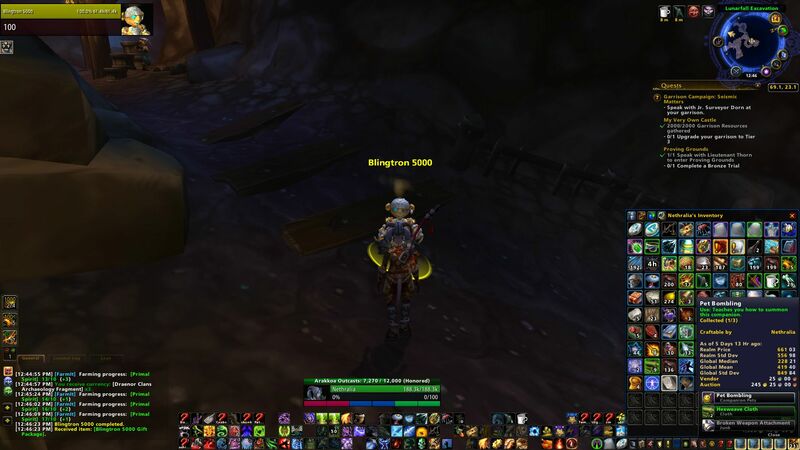 So it's a good idea to do your Blingtron 5000 daily with a char that has the engineering profession. Just had Cohete de kiparium empobrecido drop from one of these. Add it to the Contains list please! The crafting mats that drop from this seem to correspond to which profession buildings you have built in your garrison at the time (assuming you're getting and opening the package with a character that has a garrison). I've been swapping out one of my professions buildings quite a few times recently, from Engineering to Jewelcrafting to Alchemy and if crafting mats dropped from the package it always seemed to correspond with them, whereas I never seem to get those mats as drops otherwise. Would love it if others could confirm or deny this though, maybe I'm just crazy. Just got the Depleted-Kyparium Rocket from the Package, didnt even know that it was possible to get, ive gotten the pets, but the mount of never something i thought dropped from it. Does not seem to have glasses or the top hat that the 4000 package does. If you're after those, you should be getting the 4000 not 5000. Seems to have been fixed at some point so that it will only drop your relevant cooldown crafting items instead of giving you hexweave and whatnot when not a tailor/etc. Has anyone actually received Cohete de kiparium empobrecido or Recorremundos geosincrónico from the Paquete de regalo de Joyatrón 5000? I know for a fact my friend received one of them from the Paquete de regalo de Joyatrón 4000, but haven't seen any confirmation you can from 5000. I already have all the pets and the Inspector Gadgetzan from Joyatrón 5000. Was wondering if it is better to swap back to Joyatrón 4000 for the mounts? Confirm Blingatron does drop Mekgineer's Chopper. Someone dropped one yesterday at Lion's Watch and when I opened the package, Mekgineer's Chopper was in it. Liked to died of heart attack. Confirmed Paquete de regalo de Joyatrón 5000 drops Chopper de mekigeniero. Someone dropped a Blingatron 5000 at Lion's Watch yesterday, I opened the packaged and Chopper de mekigeniero was in it. Nearly died of a Heart Attack. I recieved the Mekgineer's Chopper from the package, idk how rare of a drop chance that is but hey. Can confirm Cohete de kiparium empobrecido Still drops from this. Got my first one today, never doubt the blingtron gifts. Still drops Recorremundos geosincrónico as of patch 7.0.
just a note, you can seem to get gear out of it. I just got an extremely awesome helm from this thing. Just got an Orbe de misterio from one of these. Just got a Mechanical Pandaren Dragonling from one of these bad boys.